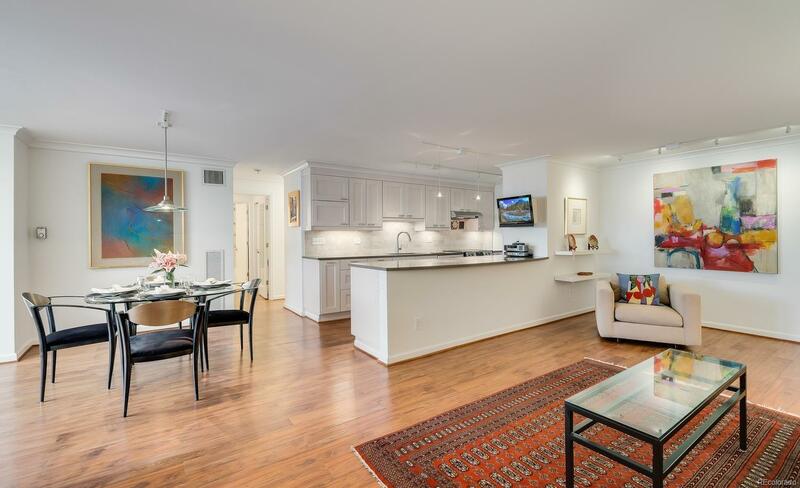 Located in the heart of Cherry Creek, enjoy mid-mod luxurious living in this corner unit that has been fully remodeled. This two bed, two bath condo featuring mountain views, is only steps away from Cherry Creek shopping, restaurants and entertainment. Designer kitchen with gorgeous quartz counters and limestone backsplash highlight the spacious and entertainment friendly kitchen area. Relax in front of the cozy fire or read a book in the fully finished sunroom with breathtaking views. Excellent attention to detail throughout the remodel, including hardwood millwork, ceramic+stone baths, track+pendant lighting, gallery space and elfa custom closet system ready for your customization. Complete asbestos mitigation and removal. All new Low-E, windrated Marvin windows with custom blinds and shades. Private storage locker. Building amenities feature, gym, pool, hot tub, game/rec room and so much more! Imagine owning a piece of Cherry creek at an amazing value! Don't miss your chance.